Walk London’s thrice yearly free guided tours have become somewhat of a fixture in the London cultural calendar. Having first discovered them exactly a year ago, I try to take part in two every weekend it’s on – although I missed the Autumn Ambles which clashed with the final weekend of the London Film Festival and, for me, the premiere of Steve Jobs. The latest Winter Wanders were bigger than ever and I decided to try two new additions to the programme one examining film and TV locations in Bloomsbury and the other along the Piccadilly Line, and for the first time I began to wonder if these guided tours have become a victim of their own success. There was only one opportunity for the Scenes on Screen – Film and TV in London walk, and on turning up to Russell Square tube station there were easily 100 people crowded together. It quickly emerged that two guides had been allocated but one had already left and this multitude were under the care of poor Stella the remaining guide who admirably shepherded the hoard on a 100 minute tour. There was a fair amount of pushing and shoving, and for some it turned into a running tour as they dashed past to be first to the next location so it wasn’t always as well spirited as these usually are. Hard to estimate popularity but given the huge interest in TV locations generally a second tour time might have been anticipated. But Walk London is actually onto a bit of winner here and has designed a walk that it can easily franchise in other parts of the city, nicely combining film, TV and advertising. It starts off light with a local costume collection at the former horse hospital behind the station before taking in Martin Freeman’s walk through Russell Square in the opening episode of Sherlock and the embarrassed Russell Hotel refusing to acknowledge its role in a Smith and Jones film about aliens despite sharing a dining room designer with the Titanic. From here we looped back round Russell Square Station to look at the McCann Erickson art deco offices – a famous advertising agency responsible for high-profile campaigns. It stops outside the Brunswick Centre, former home of Catherine Tate and one-time film location for Jack Nicholson before taking in the former home of Kenneth Williams on Marchmonth Street and London’s first gay bookshop that was recreated in Hampstead for the film Pride staring Dominic West. Round the corner was another shop used as the exterior for Black Books, as well as a strip of Georgian shops opposite Euston Station that once contained a Eurovision Song Contest flashmob but most famously doubled for Dover in ITV’s version of The Clocks staring David Suchet as Poirot. This walk saves most of the big stuff till last, St Pancras and King’s Cross used frequently in programmes like Downton Abbey or major films including The Imitation Game, The Ladykillers, Batman and, of course, Harry Potter which is set to become even bigger news this year when Jamie Parker assumes the role of the grown-up Harry in a new stage version. It’s a good tour covering a lot of ground and different types of famous location in under two hours despite the cumbersome size of the group. Arguably it missed a couple of tricks; a diversion of 5 minutes to the other side of Euston Station would have taken us to North Gower Street, the actual location of Sherlock’s front door and Speedy’s café in the modern version which would have been a big draw, and the McCann visit could certainly have warranted a Mad Men reference given the rivalry with Stirling Cooper throughout the series. Nonetheless this tour is a great addition and Walk London should consider adding more like it – certainly a Strand to Westminster film walk could cover some major blockbusters like X-Men First Class (Somerset House), Four Weddings and a Funeral (Southbank Skate Park), Suffragette (Parliament) and, of course, multiple Bonds (Westminster Bridge and Thames), as well as countless more Sherlock locations. Maybe one for the Summer Strolls given how important the film industry is to the financial and cultural life of London? The second walk was also new to the programme and is undoubtedly one of the best I’ve done so far. The Piccadilly Line – Featuring a Cricket Bat and Sherlock Holmes is a superb 1.5 hour wander through the heart of London starting at Green Park and ending at Covent Garden. Celebrating 150 years of London tube design, this walk was added especially for this year but is definitely one to retain – particularly as it is a cunning way to encourage people off the tube and to walk this relatively tiny distance. In a considerably smaller and friendlier group of 30-odd, the excellent guide Ian (pictured above) kept the tour together despite passing along London’s busiest streets on a bustling weekend. At the start we learn that the Piccadilly Line was built in 1906 running mostly under the road because permission was easier to obtain from the council-owned roads than the private landlords on either side. The Line shares its birthday with The Ritz, our first stop, built we learn by Cesar Ritz after having managed the Savoy Hotel and sits close to the Wolseley, a now famous restaurant which was once a car showroom. Across the road we learn that Burlington Arcade is clearly the place for me as whistling is banned within its parade of shops and strictly enforced by security unless you’re Paul McCartney who has dispensation to whistle there. A former garden, the shops were originally built, we learned, by Lord Cavendish the frustrated owner of the neighbouring Burlington House (now the Royal Academy) who was sick of drunks throwing oyster shells (the 18th century kebab) into his courtyard on their way home. From here we visit St James’s Church in Piccadilly, built by Sir Christopher Wren and damaged in World War II, but from the gardens we can see into Jermyn Street where Florins is visible and is the oldest continuously situated shop in London, fictionally visited by James Bond. Over the road we’re directed to look at Cordings the country clothing store who offered their best customer Eric Clapton a share in their business, while the group is set straight about the statue at Piccadilly Circus – not Eros but Anteros, the God of requited love. Leicester Square steers back to the tube as we compare the red terracotta entrance on the north edge – each station having its own colour, Ian tells us, so people who couldn’t read would recognise which station they were at – with the 1930s sleeker design next to the Wyndhams Theatre. En route to Covent Garden on the final leg of the walk we take in the former offices of cricket publishers Wisden, a peg for policemen to hang their jackets in the days before traffic lights, Stanford’s map shop which employed Kenneth Williams and was the fictional cartographers of choice for Sherlock Holmes before stopping finally outside the Transport Museum in the heart of Covent Garden with tales of the actor’s church, St Paul’s, itself a lovely summer theatre spot. 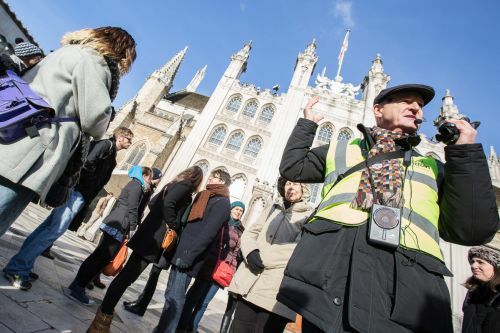 In a little over 90 minutes, this tour covered about a mile of easy walk, 300 years of history and was jam-packed with brilliant anecdotes and little tube trivia questions to think about between each stop – a fine addition to the Walk London programme. So another great weekend of learning about London and while TFL need to think about resourcing some of the more popular walks, they are a great opportunity to get to know more about our city from the learned guides. Looking forward to May already. This entry was posted on Monday, January 25th, 2016 at 12:25 pm	and tagged with Bloomsbury, capital, Covent Garden, culture, Green Park, Guided Tour, Harry Potter, James Bond, London, Piccadilly, Poirot, review, Scenes on Screen – Film and TV in London, Sherlock, TFL, The Piccadilly Line – Featuring a Cricket Bat and Sherlock Holmes, Transport for London, Walk London, Walking Tour, Winter Wanders and posted in Activity, Culture, Film, Heritage, London, Review. You can follow any responses to this entry through the RSS 2.0 feed.